Bridgeport's Cristian Sullivan makes a catch at home plate to get Westport's Nicholas Kiedaisch out during Wednesday's American Legion game at Staples High School on June 29, 2011. The Westport Senior Legion team couldn't have played much worse Wednesday. Westport committed five physical errors, a few mental errors in which the play was technically a hit but would have been out if it was played smartly and a passed ball on Strike 3 which erased an out and gave the batter a free base in a 17-4 home loss to Bridgeport. Bridgeport raised its record to 7-8 and Westport dropped to 3-9. 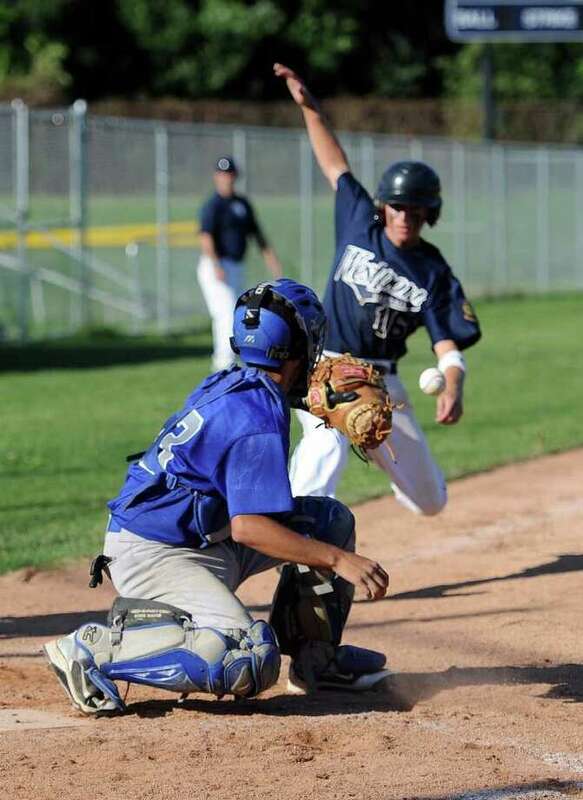 "We kicked it around and have no pitching left," Westport Coach Wayne Randazzo said. "With six guys missing, we're a different team." Westport was missing six players for various other commitments. Righty Mitch Gilbertie started for Westport and pitched five innings, allowing 11 runs on 10 hits with four walks and nine strikeouts. Only six of the runs he allowed were earned. The tone was set in the top of the first inning when Gilbertie induced Donte Younger to hit a routine fly ball to left field with two outs. Although the wind wreaked havoc with the popup, it was still catchable, but Westport left fielder Marco Romero dropped it and two runs scored to make it 2-0. Bridgeport added another unearned run to make it 3-0. Westport came back with a run in the bottom of the first but left the bases loaded and had a runner thrown out at the plate. Ben Greenberg led off with a single up the middle. Nick Kaidaisch walked and Romero reached on an error to load the bases. Alex Gandolfo then lined a single to center and plated Greenberg. However, Bridgeport righty Radonski bore down and didn't allow further damage. Radomski pitched seven innings, gave up four runs, three earned, on six hits, walked five, struck out three and hit a batter. He struck out Alex Bauer and then induced Alex Ludel to hit a fielder's choice grounder to third baseman Ricky Rodriguez, who threw home to Christian Sullivan for the out. Bridgeport started a four-run rally in the third by playing a little small ball with Younger bunting his way on Younger bunting his way on with a single. Jose Cardoso's routine popup dropped for a single to load the bases and Gilbertie then tired emotionally after that, giving up a two-run double to Mike Tantimonico. Another run scored on a wild pitch and the last one on Gandolfo's error at third base. Gilbertie was out of gas and allowed three runs in the fourth and an unearned run in the fifth. Austin Mills hit a two-out double in the bottom of the fourth with a runner on first for Westport but the home team couldn't score that inning. Westport did score runs in the bottom of the fifth to make it 11-4 and would have had more if Gandolfo wasn't robbed when he roped a shot to center field, which was caught by Younger. Bauer singled home a run to right and Ludel laced a two-run double to left. Randazzo relieved Gilbertie with Ludel and Romero (two non-pitchers) in the sixth and Bauer's passed ball on Strike 3 to Tantimonico didn't help. Both non-pitchers' problems throwing strikes and an error by Greenberg at shortstop (a natural second baseman) also didn't help. Tommy Cirillo had a pinch-hit single for Westport in the bottom of the sixth. Righty John Lobello, who is actually pitcher, hurled the seventh and Gandolfo and Bauer flipped-flopped positions, with the former moving to catcher. On a wild pitch, Geovani Gonzalez tried to advance from first to third but Gandolfo fired a strike to third and Bauer applied the tag for the out. Westport played at Bridgeport yesterday after press time, travels to Trumbull today, hosts Fairfield Saturday at 9:30 a.m. and plays at Norwalk Sunday. "Our defense needs to pick it up and we need to hit in clutch situations," Kaidaisch said. Gandolfo said, "We have a good core of kids and young talent but we need to regroup. Once we get the football kids back, we'll be ready to go."